For those of you who have never been here - it is an amazing county with unspoilt coastlines and countrysides, there you can step back in time to Medieval villages such as Lavenham, where they filmed Harry Potters 'Godrics Hollow'. Or visit a traditional seaside town, Felixstowe, with its newly refurbished Pier and Gardens. At Shotley you can watch the UK's busiest container port, with huge ships unloading all the time, then nip across to Harwich on the Ferry. And Ipswich, my birthplace, has some fabulous shops and restaurants, and the Waterfront - this is the statute of Cardinal Wolsey when it was Yarn Bombed! There you can also pick up a boat trip down the rive and pass under the stunning Orwell Bridge. The amazing Christchurch Mansion is free to visit and the surrounding Christchurch park is huge. If you are lucky, you might spot Mabel the owl in one of the old oak trees there. I'm going to be spending the day in Sudbury, where they are launching a new Vision for the future of the town. 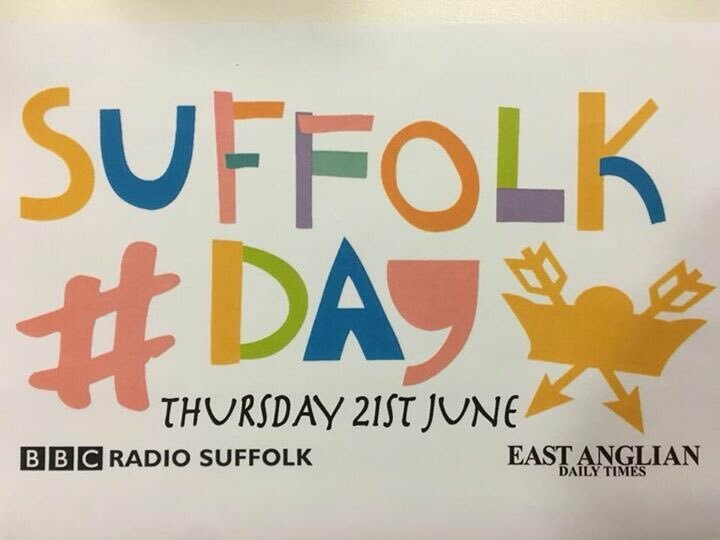 If I have tempted you to come here, there is far more information on the Visit Suffolk website.